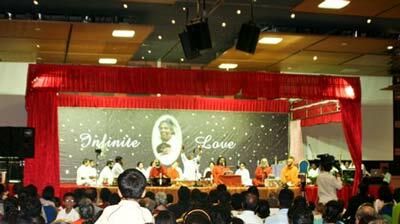 Swami Amritaswarupananda Puri to visit Kuwait and Dubai from May 7 – 12 and will conduct satsangs & bhajans there. 9 May 2008 (Fri) Sindhi Ceremonial Hall, Bur Dubai 2:00 p.m. – 5:30 p.m.
10 May 2008 (Sat) Astoria Banquet Hall, Bur Dubai 7:30 p.m. – 10:00 p.m.
11 May 2008 (Sun) NMC Hall, Abu Dhabi 5:00 p.m. – 9:00 p.m.
12 May 2008 (Mon) Astoria Banquet Hall, Bur Dubai 7:30 p.m. – 10:00 p.m.
Amma arrived back in Amritapuri after her Asutralia tour of 2008. There is an old Marathi saying: sadhu sant yeti ghara toci divali dasara—When sadhus and saints visit your house, it is the real Divali and Vijaya Dasami. 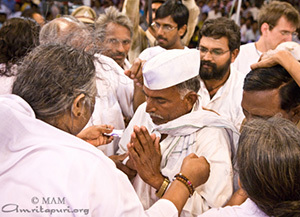 When Amma came to give darshan in Washim, the villagers there proved their faith in this maxim by dedicating themselves fully to the celebration. 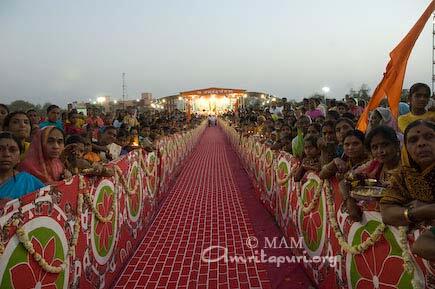 Every house was cleaned and decorated in traditional festival style. 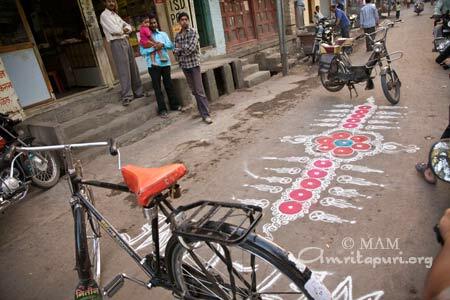 Rangoli were drawn at door-fronts, mango leaves were hung from awnings, the stocks of banana trees were fixed before houses, dipams were lit and water sprinkled about as a rite of purification. 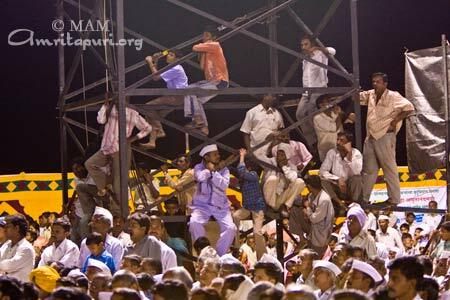 In Maharashtra it is also a tradition to have guests stay in one’s house for Divali, so near and dear ones were also invited to come and participate in the function. 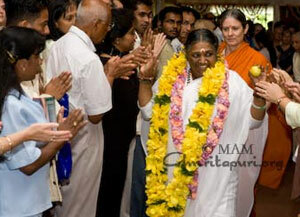 But this was only on the day of Amma’s arrival. 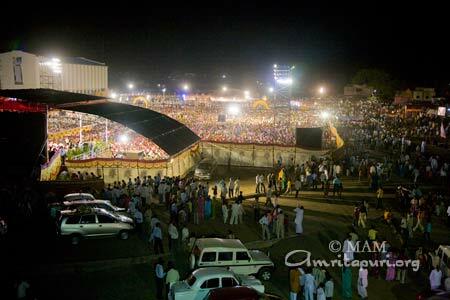 In fact, preparations had been going on for months—even before it was announced that Amma would be coming to Vidarbha. 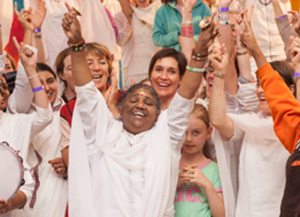 When the rumour of the possibility of Amma holding a program in the town began to spread, 125 people went to a local temple and offered archana. By the time the date was set, there were more than 1,000 volunteers to help with the arrangement. The volunteers, literally, personally invited each and every family in the area. This was also done in traditional fashion. 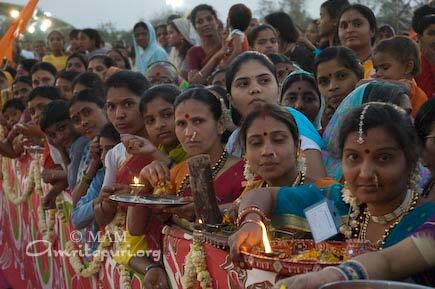 Ladies, in groups of five, went house-to-house. 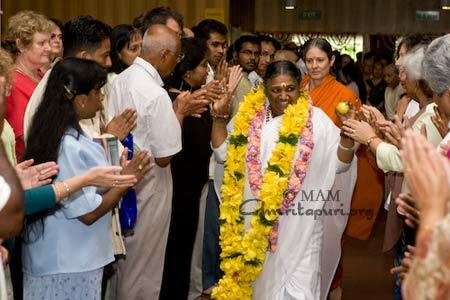 The first lady would place a sticker of Amma on the door, the second would apply kumkum to the forehead of the lady of the house, the third would bow to her feet, the fourth would offer her the invitation, and the fifth would take down the family’s name and address. 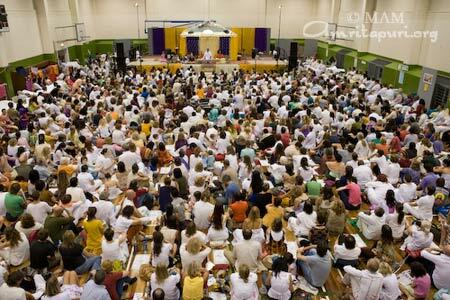 In this way, more than 100,000 hand-written invitations were issued. 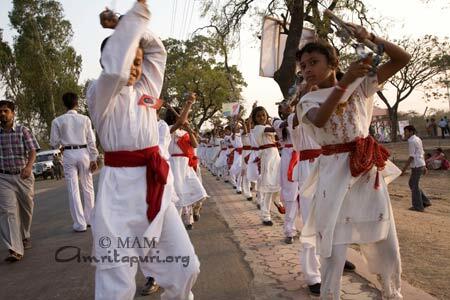 From the beginning the program was the people of Washim’s own, and everyone there got involved, including many non-Hindus. 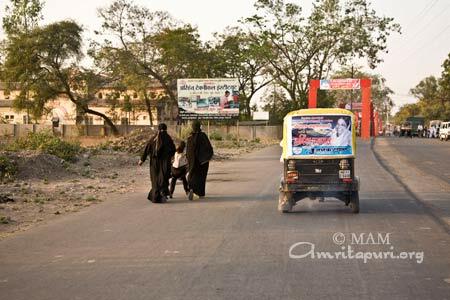 A group of villagers from the Muslim faith arranged for banners to welcome Amma in Urdu. 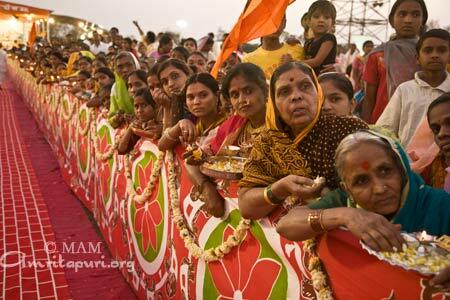 Another donated 30,000 oranges to use as prasad. Another man donated chai for 10,000 people. 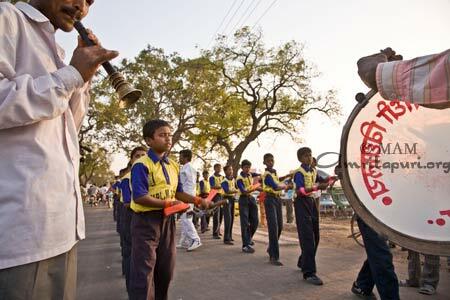 Even the rickshaw drivers got into the spirit, announcing that they would charge half prices on the night of the program. 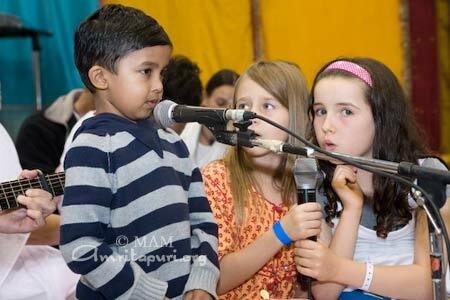 “The people here are of many sects, many religions and have many family gurus, but all felt that Amma was their own mother,” said a brahmachari from Maharashtra who helped organize the program. One man offered to donate all the milk needed for the program from his dairy, located 70 kilometres from the venue site. 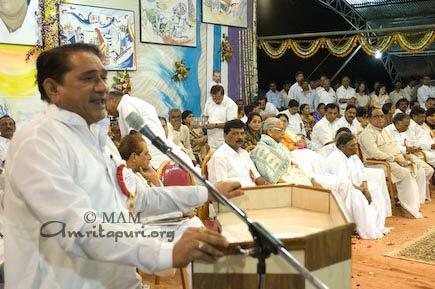 The man said that a few years before his brother, a farmer, had committed suicide due to the burden of debt. 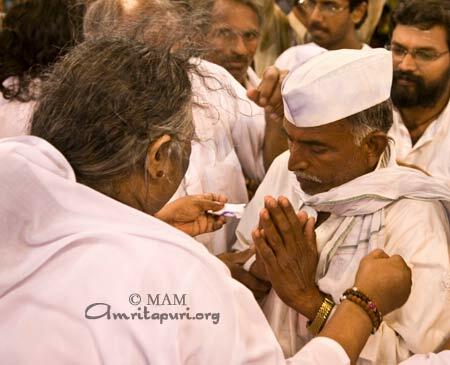 Saddened by the fate of his brother and too many other Vidarbha farmers, the man offered the milk, praying it would help their souls find peace. 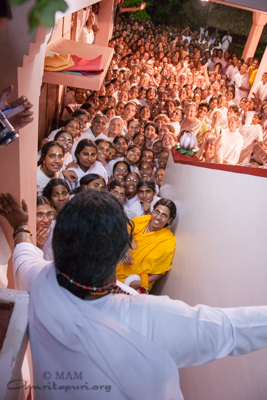 On the morning of the program, 150 devotees performed abhisekha to the local deities—Balaji and Madhyameshwar—requesting that there be no obstacles in the function. 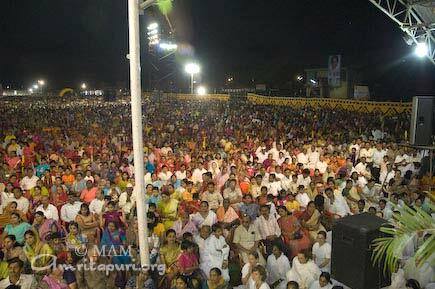 The devotees also invited the deities to come to the program for Amma’s darshan! 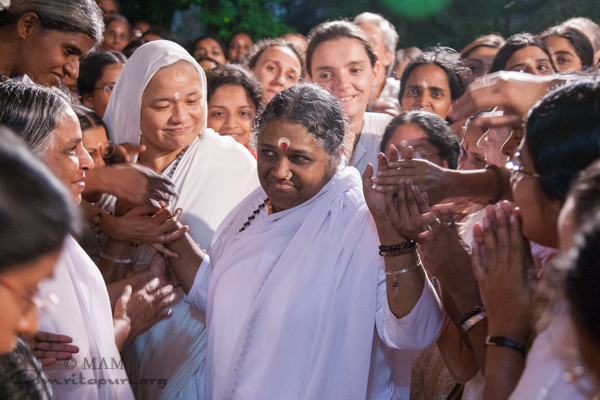 While Amma was giving darshan, a brahmachari working in the kitchen told Amma that the khichadi prepared by the Washim devotees was very tasty. 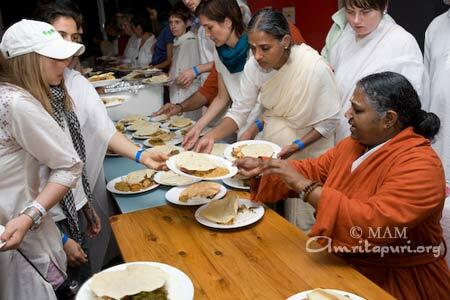 Amma immediately asked him to bring a plate for her. 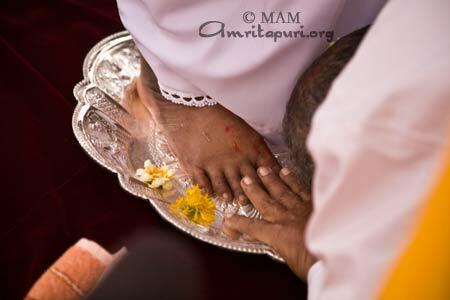 He did so, and Amma tasted it as she gave darshan, relishing the devotion with which it was prepared. 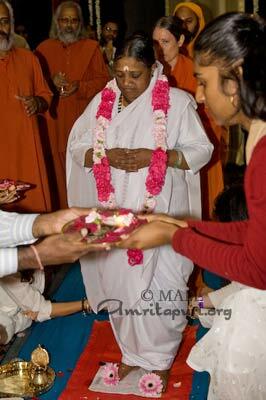 She then asked for someone to call the devotee and Amma gave him a very special darshan. 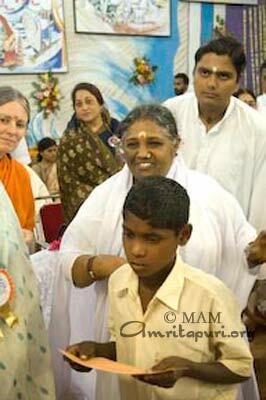 Afterwards he told one brahmachari that for 32 years he had been suffering from back pain, and that when Amma had held him, her hand had pressed exactly on that point. 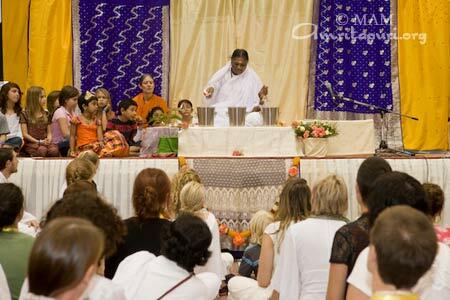 To his surprise, after his darshan the pain was gone. 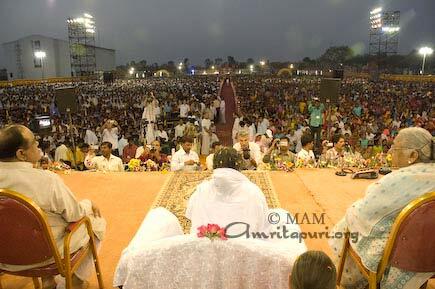 After the program’s conclusion, for many, life in Washim continued to revolve around Amma. 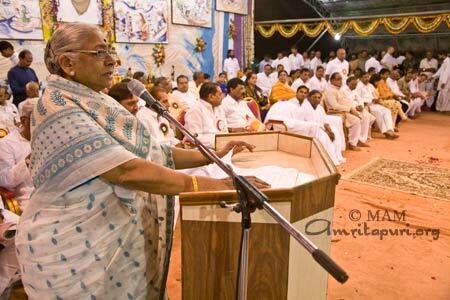 “Everyone was talking about Amma, discussing Amma, crying over Amma,” said one of the brahmacharis in charge. 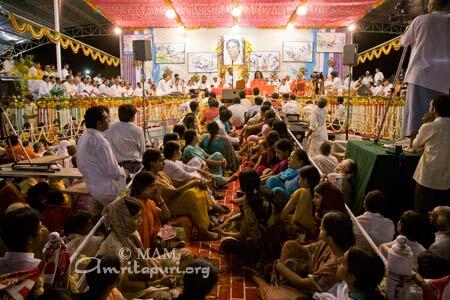 Already Amma’s new Washim devotees have begun planning a pilgrimage to see Amma, with arrangements being made for some 1,500 people to come to Amritapuri in August 2008. 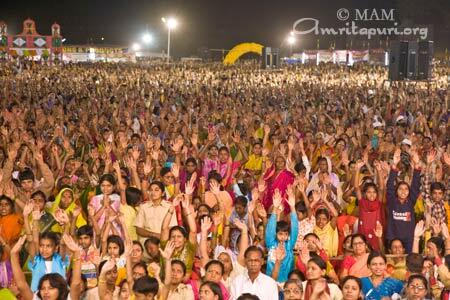 In fact, Amma’s visit has not only offered the people of Washim spiritual solace, but also material upliftment. 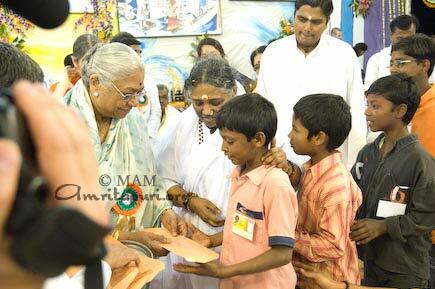 During the program, Amma offered a number of people the opportunity to come work at the Ashram’s AIMS Hospital in Cochin, Kerala. 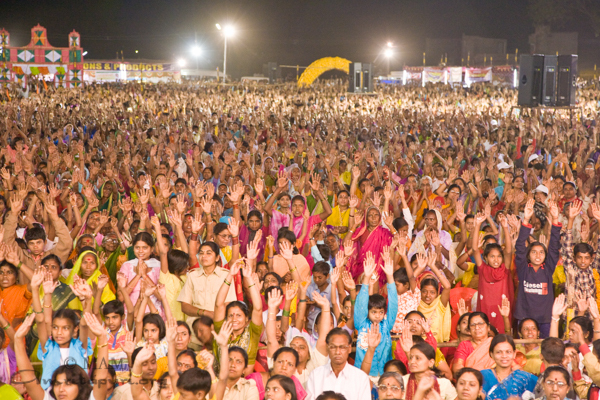 And at Amma’s suggestion, devotees from Indoor and Nagpur are considering starting businesses in Washim in order to expand the employment options of the people there. 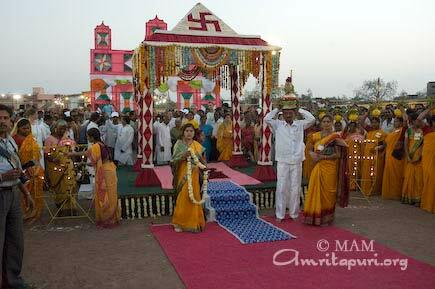 1 Dasaratha, the King of Ayodhya and father of Lord Rama, was once hunting in Washim. He was an adept archer and had mastered a subtle skill known as sabda vedi—the ability to discern and strike targets by sound alone. Hearing what he believed to be an elephant, Dasaratha let an arrow fly, only to kill a young Brahmin boy by the name Sravana Kumara. Sravana Kumara’s father, a rishi, cursed Dasaratha, saying, “May you, too, one day know the pain of losing a son.” This curse would find fulfilment many years later when Dasaratha was forced to send Rama into exile for 12 years. 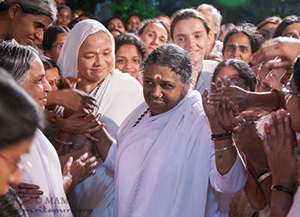 Hearing his question, Amma laughed and said, “You yourself are the proof, because you are God.” Amma then explained that to deny God’s existence is like using one’s tongue to deny the existence of the tongue. 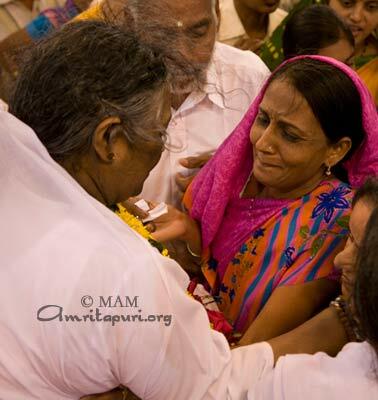 Amma then called the man to her. 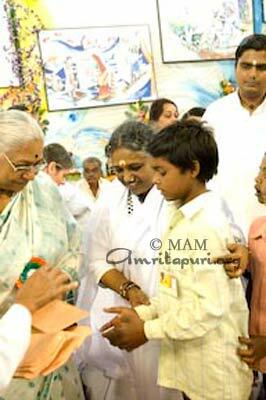 When he approached, she said, “Open your heart and love like a child. Then you will know God.” Hearing this, he leaned forward and laid his head on her lap. 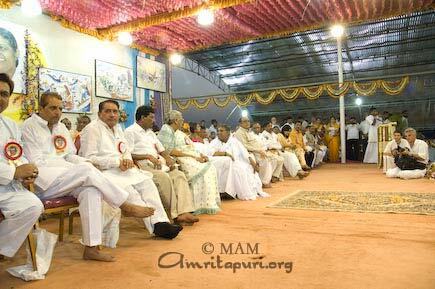 In between lines, Amma playfully told the devotee “Make faces! Make eyes!” She then demonstrated, glancing playfully from side to side, arching her eyebrows and making loving eye contact with those around her. 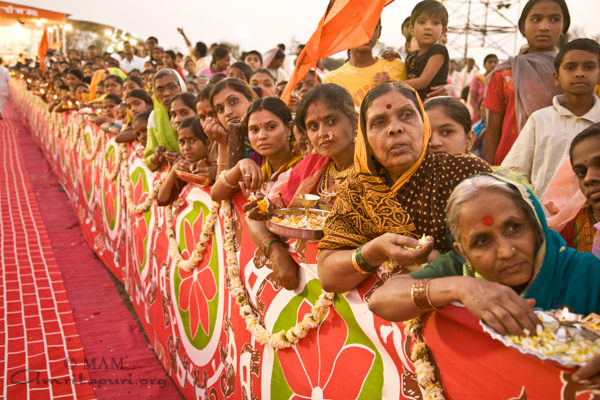 She then added a new element to the song, creating a break between a few words and then crying out, “Hoyi!” The devotees would sing “Mata Rani,” and Amma would respond “Hoyi!” before continuing the verse. 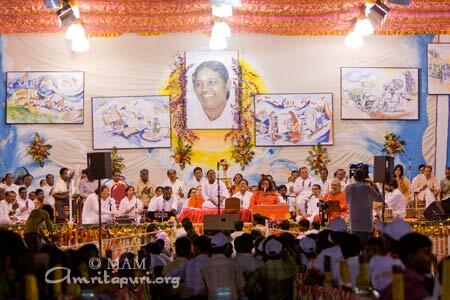 As the song finished, everyone stood in contented silence around Amma. 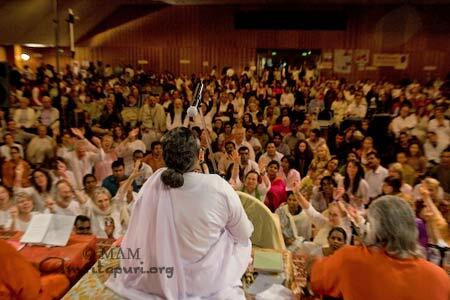 Amma held her eyes closed, absorbed in stillness for a few moments. 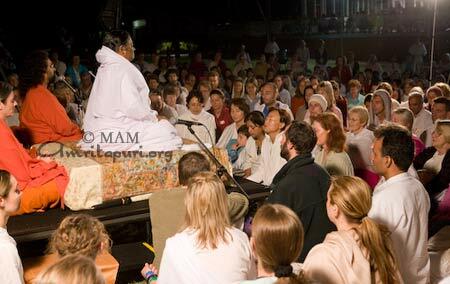 Then, in the midst of the silence, Amma slowly started to sing out “Narayana Narayana Jaya Govinda Hare…” The harmonium immediately picked up the tune, and soon the devotees raised their voices again to join her. 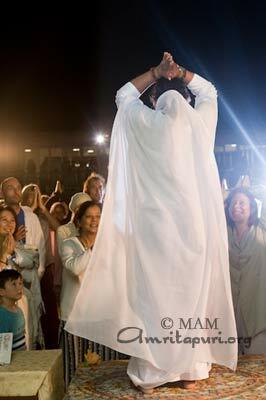 In this second dance, Amma kept her eyes closed the entire time, rocking back and forth in bliss. 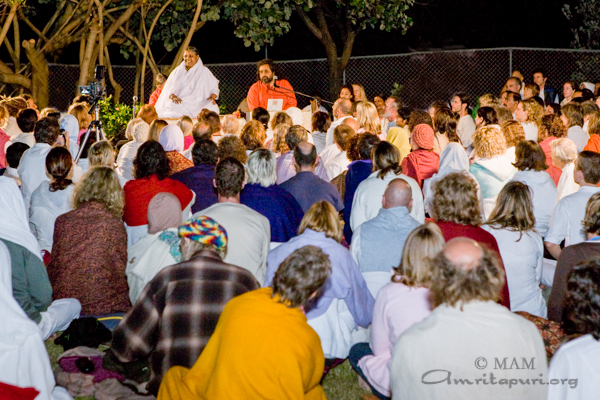 As she finished, she sat down and asked everyone to meditate for a few moments, feeling themselves filled with divine bliss. 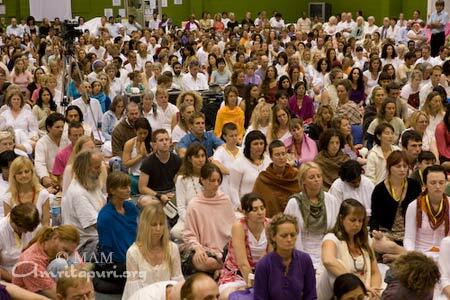 After a few minutes, Amma stood up and quietly exited the hall. 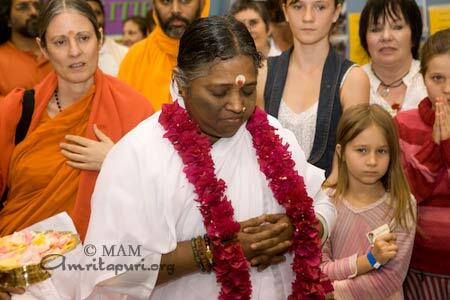 In order to reach her room, Amma had to walk outside, next to an open meadow. 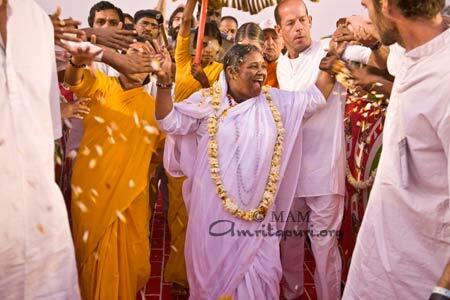 As she walked, Amma maintained complete silence, and gazed at the sky and grass in front of her. 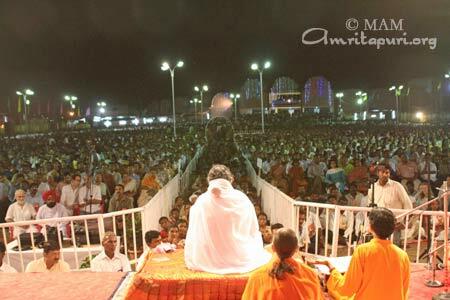 Just before she reached her room, Amma’s eyes caught sight of a huge flock of birds suddenly bursting into flight across the open sky. 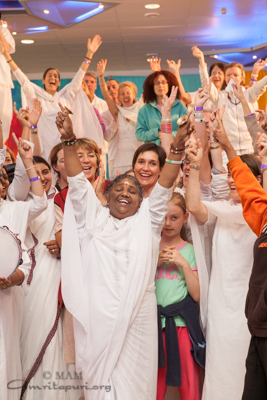 Seeing this, Amma joyfully cried out, “Oh!” and stretched her arms towards them. 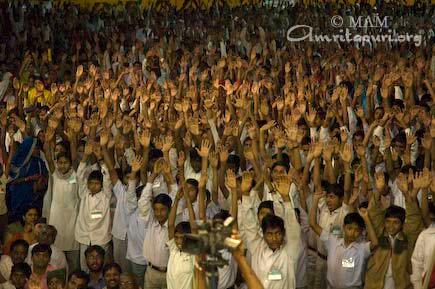 She then imitated their flight by waving the palms of her hands. 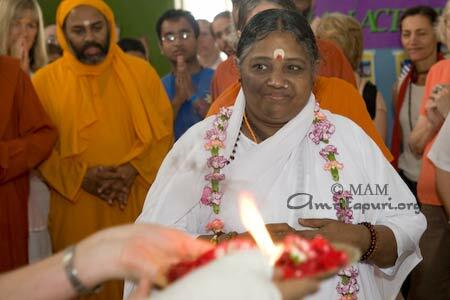 Smiling, Amma she then turned and entered her room, leaving those around her touched by this quiet third dance with nature. 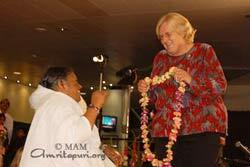 Reverend Helen Summers, the founder, director and minister of the Interfaith Centre of Melbourne, also welcomed Amma. 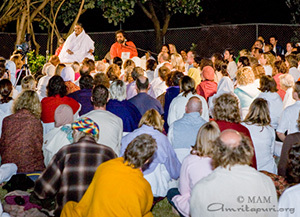 After giving a heart-felt summary of Amma’s charitable activities, she invited Amma to speak at the next Parliament of World’s Religions, which will be held in Melbourne in 2009. 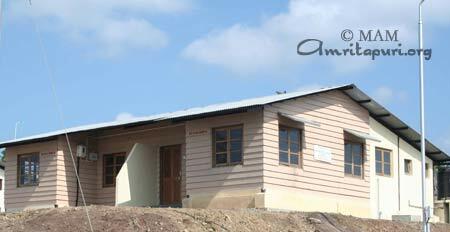 When the tsunami hit the Andaman-Nicobar Islands, nearly 10,000 houses were destroyed. 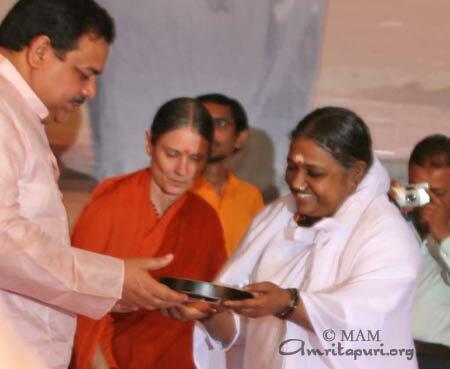 On March 24, Amma flew the 1255 kilometers from Kolkata in order to bless the people there with her darshan and to distribute the keys to 50 tsunami-relief homes constructed by the Ashram. 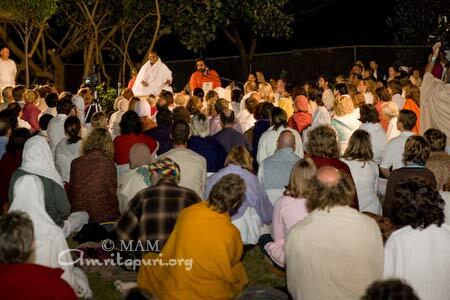 The program was held in Bambooflat, South Andaman. Houses were constructed both there and in Austinabad. 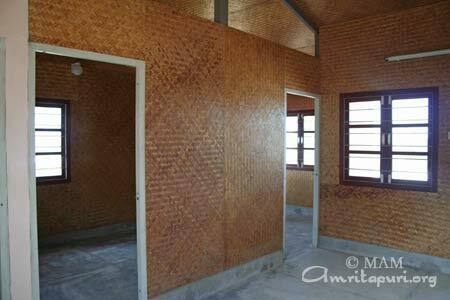 A symbolic key to the houses was blessed by Amma and then handed over to Union Minister of State for Human Resource Development, M.A.A. Fatmi. The key was then received on behalf of the Andaman & Nicobar Administration jointly by the acting chief secretary, Arvind Ray, IAS, and the commissioner of R&R, Dharam Pal, IAS. 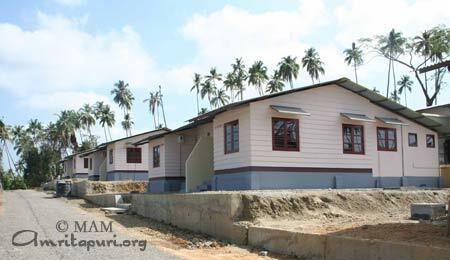 Another 150 homes are still in construction. They will be finished by the end of April. 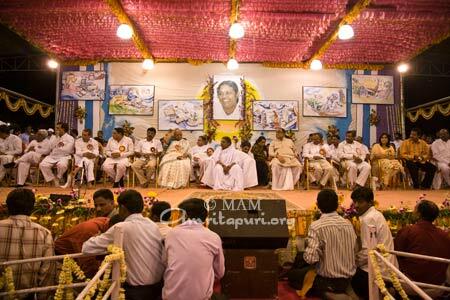 Amma’s program was the largest gathering in the history of the Andaman Islands. 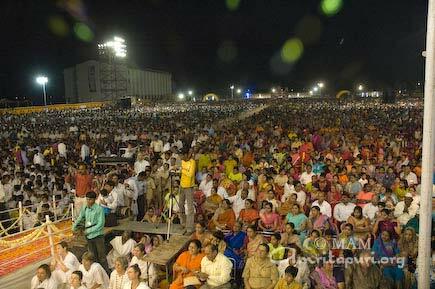 More than 15,000 people gathered, with the grounds overflowing, even before Amma’s arrival. 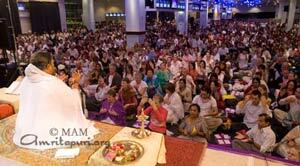 Amma held four days of programmes at the huge Singapore Expo complex near Changi Airport. 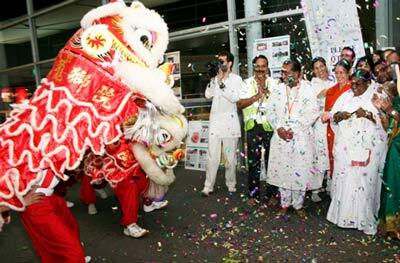 Holding true to Amma’s teachings of selfless service, the Amriteshwarii Society of Singapore has been active in community service throughout the year. 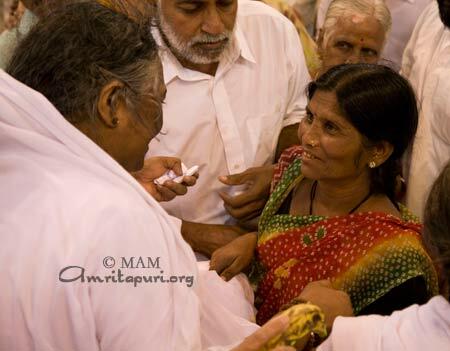 Twelve impoverished, elderly, and disadvantaged citizens were on hand to receive provisions that Amma distributed during a special ceremony on the first night. 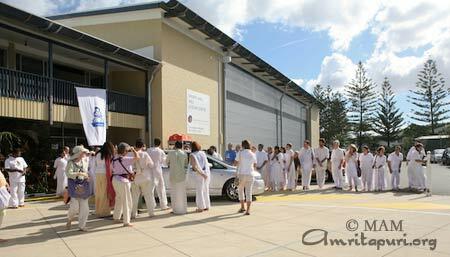 Amma also distributed 30 new wheelchairs which were being donated to various health agencies in Singapore. 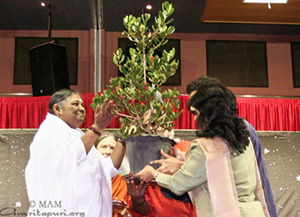 On the second night, blessed a sapling that will be planted in a nearby park. 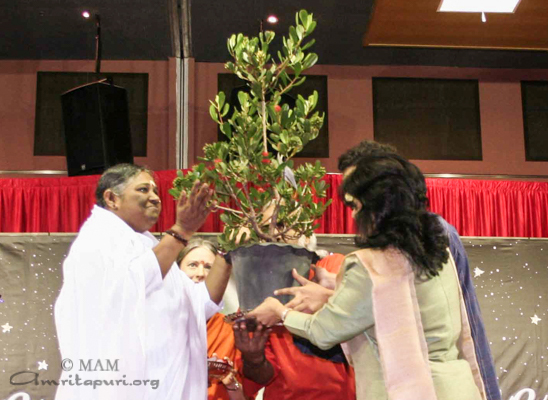 – 50 such saplings have been pledged by the Amriteshwari Society as part of Greenfriends’ initiative. 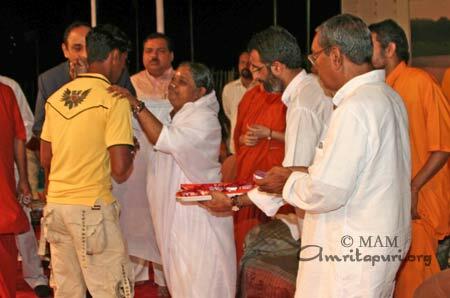 As was done in previous years, The Amriteshwarii Society also held a blood drive. Dozens of donors lay on cots set up just outside the hall. 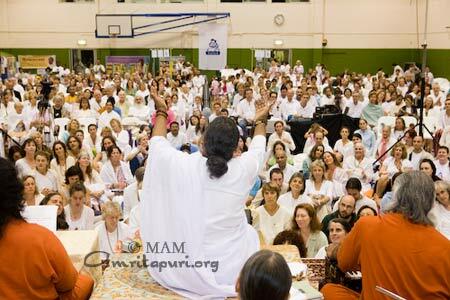 While life-giving blood flowed through the small tubes inserted into their arms, they could listen to bhajans and watch Amma give darshan on a large screen. 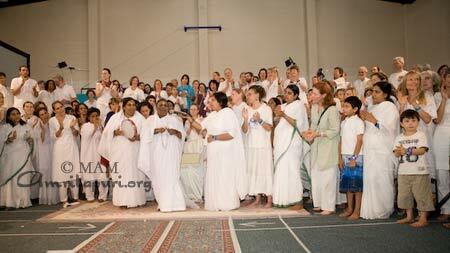 On each of the first three evenings, Amma was treated to a special cultural performance upon arriving at the hall. 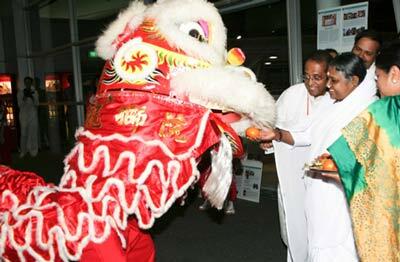 The first night, Amma was entertained by a Lion Dance during which Amma fed the lion. 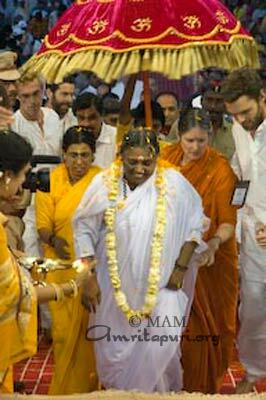 At the end, a small ‘firecracker’ burst, sending a shower of colored paper down on Amma and everyone nearby. 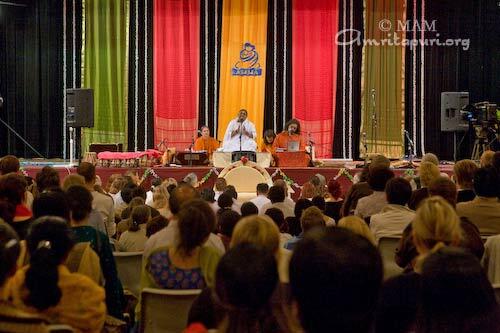 The second evening saw a Bhangra dance group performing for Amma in the lobby of the hall while hundreds of devotees watched from a balcony above. 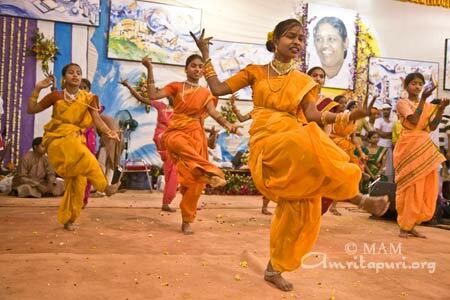 A traditional Indian dance group greeted Amma on the third evening.